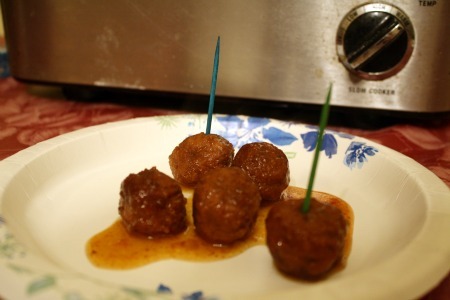 The easiest cocktail meatballs in honor of the GIANTS! Well, it’s happening again…the Giants are heading back to the Super Bowl! Big news for us here as we are lifelong fans. SUCH a great game last night! Can’t wait for the big day. Speaking of the big day, I bet there are lots of parties being planned for it right now. Some will be small gatherings while others will be big bashes. Back in my single days, I spent Super Bowl Sunday every year in Vegas (which also dubbed as my birthday celebration, since it’s always close to SBS). These days I stay local and usually head to my cousin’s house for one of her fun parties. People are always looking for different football food ideas, and simple ones are usually happily welcomed. Well folks, it really doesn’t get easier than this. This was something I literally threw together on New Year’s Eve after surveying what was in my fridge and freezer. And it was delicious. So, who will you root for in the Big Game? Place ingredients in a crockpot. Cook on high for a few hours…more if the meatballs were frozen. Serve with toothpicks. This entry was posted in appetizers, beef, crockpot, QuickAndEasy. Bookmark the permalink. 3 Responses to The easiest cocktail meatballs in honor of the GIANTS! I love how easy this is! They look tasty. If you have friends and family who like spicy stuff, try the same thing with meatballs and pepper jelly – its sweet/spicy combo is amazing!